Those of you who remember when we used to celebrate the festivals of the Christian calendar — in name at least — will recall their Sunday school or RE lessons from this time of year. They told us the story of Easter week: the putative Christ humbly arriving in the Holy City of Jerusalem on a donkey to be feted by adoring crowds on Palm Sunday. In less than a week, he had become utterly reviled, abandoned in large part by his disciples, then nailed to a crucifix to die a painful death before resurrecting on the third day. Those who understand the Bible will know that the New Testament, like the Old, is not a record of history but a prophetic and figurative tale predicting the coming of a Saviour or Chosen One. And it is a story told by many different cultures. 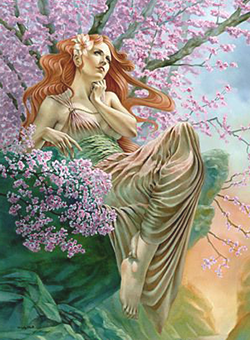 The word ‘Easter’, after all, is pagan, coming from the Germanic Goddess of the dawn (of new life at springtime), Eostre. On my own personal odyssey, ‘Easter’ week came in June 2007. It began on ‘Palm Sunday’, when a friend showed me his new lecture: ‘The Bloodline of the Astrologer King-Priests’, which he illustrated with reference to symbols in the Da Vinci Code film. As I watched his talk unfold, I realised that the symbols he said were sinister in fact had another completely opposite meaning: they gave insight into the reincarnating Jesus (of whom Leonardo, the greatest genius who ever lived, was one). Towards the end of the talk, my friend showed a clip of the film in which the hero Robert Langdon says to Sophie, the ‘blood descendant of Jesus Christ and Mary Magdalene’: “It’s what you believe” that’s important. At this point, I was being bombarded with messages from the divine that I was somehow The Prophet; that I was being chosen for a special mission by the ‘Spirit’ that had been guiding me by that point for two and a half years, without ever revealing His identity. Even though I was wholly open to the spiritual by this time, like any sane man I thought that the Universe was testing my egotism by telling me I had been chosen for such an exalted role. So I had been ignoring it. Now, looking into Langdon’s — Or Tom Hanks’ — eyes, I realised I had not applied one of the most central teachings of Qabalah: “Believing is seeing”: we have to be prepared to believe something before we actually come to know whether it is true or not. The date was 24 June, John the Baptist’s Day or Midsummer’s Day, the holiest day of the year after Christmas itself. ♦ The Rod of Aaron, the symbol of divine authority carried by Moses brother, Aaron, the first high priest of Israel. ♦ A passage in the Talmud commentaries discussing the name of the Messiah. 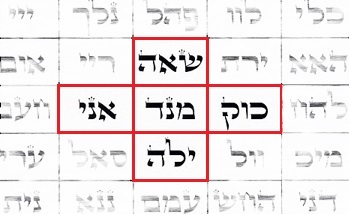 ♦ A messianic (equal-armed) cross, close to the centre of the table of the 72 Names of God. In each of them, I found the Hebrew letters, which spell out my name. This was a turning point for me. Up until then, all I had was past-life memory and divine signs to indicate I might have a special role in creation. Now, I had hard and fast documentary evidence. The texts mentioning my name were already associated with the Messiah or the Name of God for at least 2,000 years before I was born. Then later that day, 28th June 2007, I was told by the ‘Spirit’ that I would be up all night facing the forces of darkness. At one point, I had to literally resist invisible forces trying to knock me over or enter my body. If I hadn’t been a man of faith, I’d probably have been driven mad. Having seen off these forces, I was then taken astrally to London where the ‘Spirit’ told me to clear the darkness from London. I spent several hours channelling God’s love on the city, not knowing exactly what I was doing. At one point, a painting of chessboard in perspective I had done at the age of 18 flashed into my mind for no apparent reason. The next day, I went to my friend’s. The first thing he told me was that a bomb hadn’t gone off in London. As we were speaking, a newsflash came on the TV: another bomb had been driven across London without going off. It seemed I had channelled God’s Love successfully. But then it got stranger still. My friend turned his computer around to show me the latest crop circle. 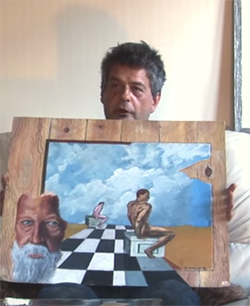 It showed a chessboard in perspective, like one I had painted when I was 18. Before I could say anything, he showed that someone had superimposed Leonardo’s Last Supper over the columns in the crop circle also depicted going into the distance. So — in line with the codes of the Most Ancient Prophecy, one week, one day before 7777, or Saturday 7th July 2007 — I was anointed by the divine. I can only describe it as ‘the heavens opened’. They poured out not rain but the divine light of God’s love. 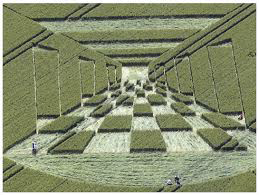 The above crop circle or glyph is known as ‘The Doors of Perception’. It appeared in a field by the ancient longbarrow at West Kennet, Wiltshire on 28th June 2007. ‘Kennet’ is a transliteration of the Hebrew word for ‘sacred or vital knowledge’ in Qabalah. As soon as I saw it, I realised it was my sign, partly because it made me remember a painting I had done when I was 18. 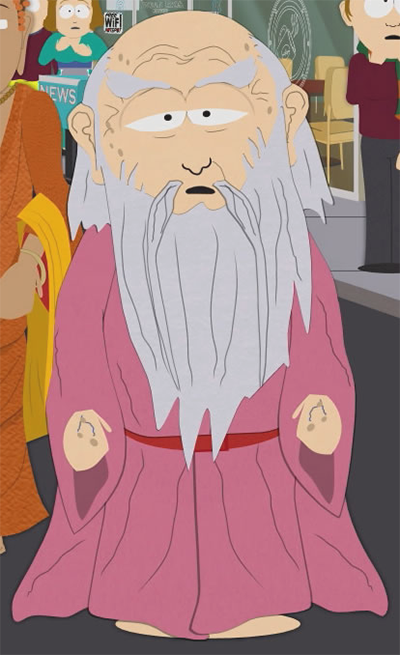 Lao Tzu, the author of the Dao De Ching, as he is depicted in the South Park episode, Super Best Friends. The experience was the most intense of my life — almost as if a human body could not bear such a pure and magnificent love — and went way beyond any drug high or sexual ecstasy. In order to attune myself to the divine resonance, I sought inner peace in the only way I knew how. I performed the Qabalistic Cross meditation, also known as ‘the Crucifixion’ (which for some reason I always used to misspell ‘Crucifiction’) partly because you end up making the shape of the Christian Cross. I finished up face down though because that was the only position I could adopt in the face of the magnificence of creation, which I had just witnessed and downloaded. Later that day, I had another sign or synchronicity, as the New Agers call it: the first television programme I saw was South Park, the Superbestfriends episode,. In it, Jesus Christ, a man with no magical powers, has to defeat the magickal and evil David Blaine to save humanity, calling on the Superbestfriends Lao Tzu, the Buddha and Krishna, other incarnations of the Jesus soul. Three weeks later, as the Holy Grail, I found myself in an old VW Polo — or donkey — winging my way to Glastonbury to publicly announce the New Age of the Christ with the reincarnation of Joseph of Arimethea, as also predicted by the Prophecy. So Christ did not die on a cross to save humanity from its sins. He was metaphorically crucified — made into the equal armed cross symbolising balance, not the cruciform which symbolises a world ‘out of joint’ — to be able to teach each human being the path to their own salvation. That is an important point. I cannot save you if you do not choose to go on the path to enlightenment. But once you have made that decision, I can teach you the Way (or the Dharma, if you Buddhists prefer I call it that). So rather than repudiating the tales of the Bible, spare a thought this Good Friday for your own salvation and how you might better serve God and man. In other words, concern yourself not with the splinter in my eye but with the plank in your own. Then we might finally end once and for all the terrible assault on mankind perpetrated by the dark forces and usher in the Dawn — or Eostre — of the New Age of love, justice and peace.